On ears? In ears? Why not both? When it comes to listening to music, most headphones are equivalent to an audio "magnifying glass" -- they amplify whatever sound is fed into them. 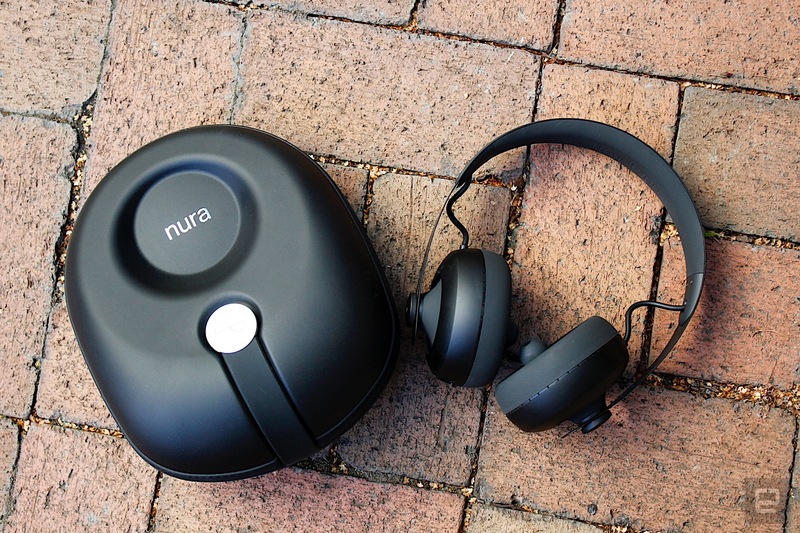 Nura and its semi-eponymous Nuraphones ($399/£349) aim to be more like prescription specs for your ears, by analyzing your hearing and creating a bespoke audio profile. It's an interesting idea, and an even more interesting design. The Nuraphones determine your personal hearing profile by listening to "otoacoustic emissions" -- sounds emitted by the inner ear when stimulated -- with a tiny microphone. These emissions reveal a lot of info about our hearing, enough that Nura believes can be deciphered into a sort of hearing "fingerprint." Nura takes this fingerprint and uses it to adjust the audio signal from the headphones. The end result is a bit like a personal EQ setting, without all the guesswork, designed to make music sound like the artist intended (rather than amplify arbitrary frequencies). It's a tantalizing prospect: Corrective headphones that know the quirks and failings of your beleaguered ears. When we wrote about them last year, I'll admit I was skeptical. Pretty much every headphone pitch I have ever had (and that is many) has espoused the virtues of its revolutionary audio, be it custom drivers, magical sound engines, dynamic doo-dahs or cutting-edge EQ algorithms and so on. But none of that helps if you're not able to hear all of those sounds and frequencies equally. Setting up the Nuraphones is a bit more involved than most other headphones (in that there's even a setup process at all), but it's simple. Using the companion app (iOS/Android), you are first guided to make sure you have the headphones placed on your head correctly. Nuraphones have an unusual configuration that we'll get into later, but this makes it important to have them on just right during setup. Once you have them on properly, the app plays some audio that sounds a bit like a futuristic fax machine. This doesn't last long, but it soon moves onto the next stage of configuration, which takes a little longer. All in all, it takes about a minute. Once complete, you can save your profile and forget about it if you wish. Naturally, the first thing I wanted to know was how it sounded without the custom profile. Fortunately, this is easy to do in the app, as there's a switch to toggle between generic and custom audio. I'll be honest, the difference was incredible. In the generic setting, the audio sounded actually pretty bad. But once I put on the custom profile, the music sprang to life. The first thing you notice is that the music is louder. This alone -- a simple bump in volume -- is often enough to "trick" the brain into thinking something sounds better. (There's an old DJ trick of casually lowering the volume on the previous DJ's last record so that your first one invokes the same feeling.) I could tell straight away though that there was more going on here. The music didn't just sound louder, it sounded more "complete." All the different frequencies in the music felt balanced and natural, and not "juiced." After listening to a number of different tracks in different styles, I was actually somewhat excited. There's an intangible, magical feeling you get when listening to well-recorded audio on a high-end system. This isn't quite the feeling I had here, but it was similar. A sense that music feels alive -- clearer, almost. 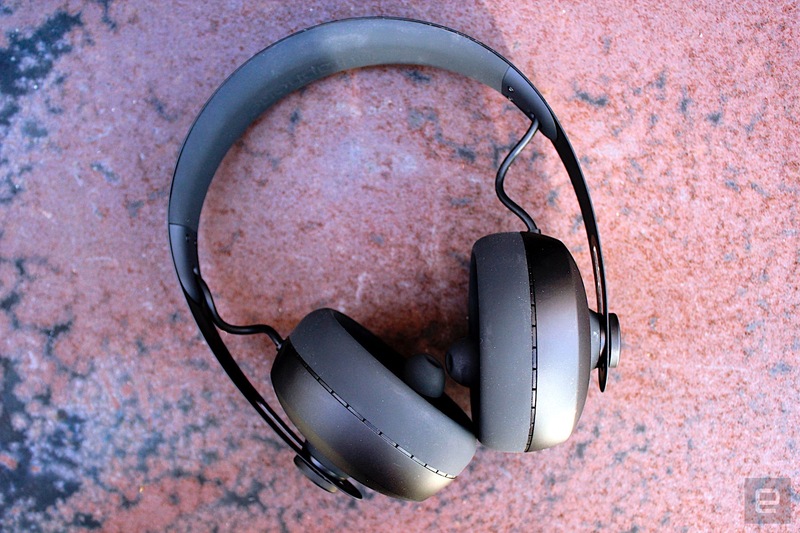 The Nuraphones have a few other features that help the music along, too. 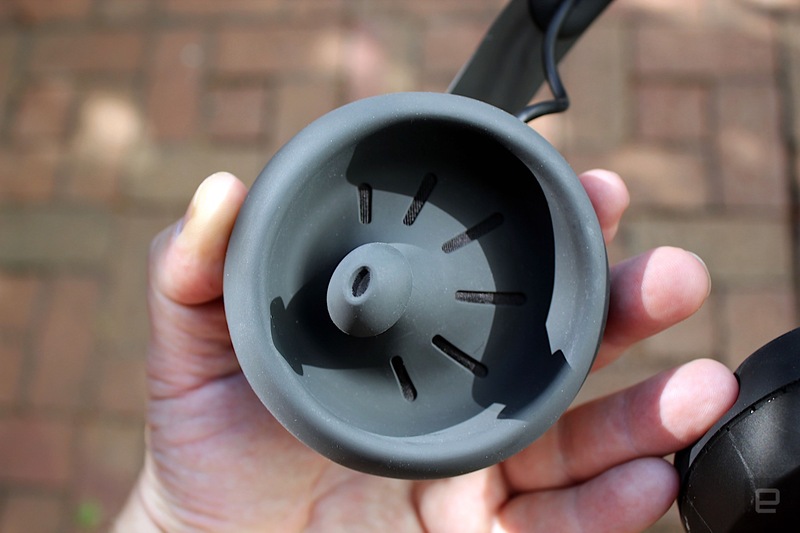 While they look like over-ear headphones, each cup has a protruding "stalk" that goes inside your ear. Both the outer section and in-ear part provide passive noise canceling, so the effect is doubled. In a room with people talking right in front of me (and no music playing), I couldn't hear a thing. The second trick that Nura added is tactile bass. Inside the on-ear part are transponders that respond to low frequencies (bass) with vibrations. It's not just an on/off vibrate, it's responsive to the frequency. Similar to how SubPac or Basslet work. The idea is that you "feel" the bass while the in-ear part focuses on the midrange and upward. It works very well (trust me), and I'd love to see this option in more headphones. If you're wondering, you can disable the "immersion" feature (as Nura calls it) or, conversely, go wild, and jack it right up to face-melting levels. By now, you can't help but have noticed that these are no regular headphones. The design alone will tell you that. When I first saw the two in-ear drivers poking out of the cups, I didn't know what to make of them. Each stalk is spring-loaded, so it doesn't poke you in the side of the head (or push into your ear too hard). The spring is cleverly engineered so it retracts/extends slowly. The upshot is that sometimes you adjust the headphones and then feel the tip of the stalk slowly worm its way into your ear canal. You might also have noticed these stalks are... mildly "anatomical" looking. It's a little weird, but not unpleasant. I did find myself having to readjust the Nuraphones a fair amount. Not constantly, but maybe two or three times an hour I'd find myself reaching for either side just to get it in a slightly sweeter spot. The earbud stalks aren't uncomfortable, but it's more about making sure you have them inserted properly, so it becomes a bit of an unconscious twitch to be sure you have them set right. The Nuraphones' weird earcups aside, the product experience as a whole is thoughtfully designed. The rubber sections that rest on the side of your head can detect when you're wearing them. This is, in fact, how you turn the Nuraphones on -- simply put them on your head. There are two touch-sensitive buttons "hidden" in the circular caps outside the strap (where you adjust the fit). These can be configured in the app to do whatever you want. There's likely a compromise here, as you'll have to choose between skipping tracks, audio profile toggling, answering calls ... whatever the two things you need the most. I often want to pause or adjust the volume on the go, but obviously want to be able to answer calls too, without reaching for my phone.There's no button to activate Bluetooth mode, either. Anytime the headphones aren't connected, they default back to pairing mode. This minimalist approach feels smart when it works. But if you need to toggle Bluetooth (as I sometimes did) or want to reboot the headphones (as I sometimes did), it's a bit of a guessing game -- setting them down for a bit and putting them back on. Likewise, occasionally I'd lift one earcup off to talk with a friend, and the headphones would turn off. They'd reconnect again in a few seconds, but it's a minor break in the experience. For those who prefer a wired connection, you have plenty of options here. 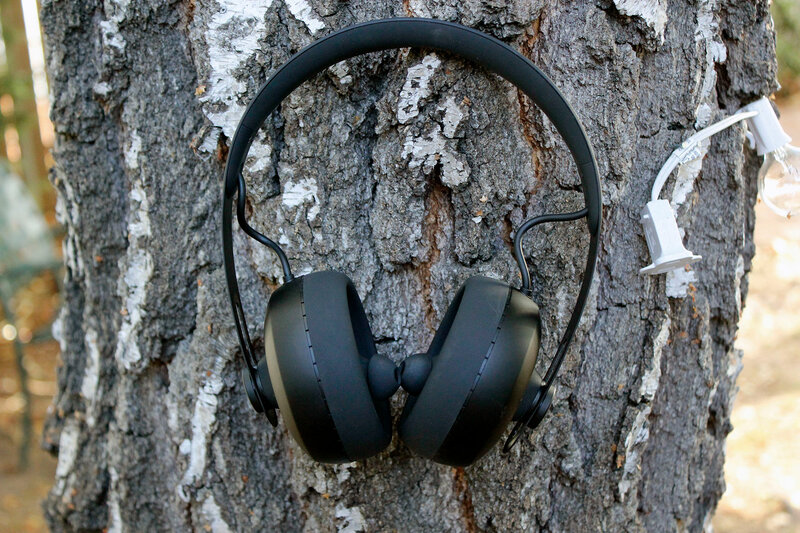 The Nuraphones come with a USB A cable for charging, but there are USB C, micro-USB, Lightning and 3.5mm audio cables available too (for an additional cost). Despite the minor quirks, the whole experience feels refined. Smart, even. And it'll likely only get better. A feature in beta is that the headphones can detect who's wearing them (if they have a profile set in the app). I tested this with my wife, and it works well -- telling me "Welcome back, James" every time I put them on. 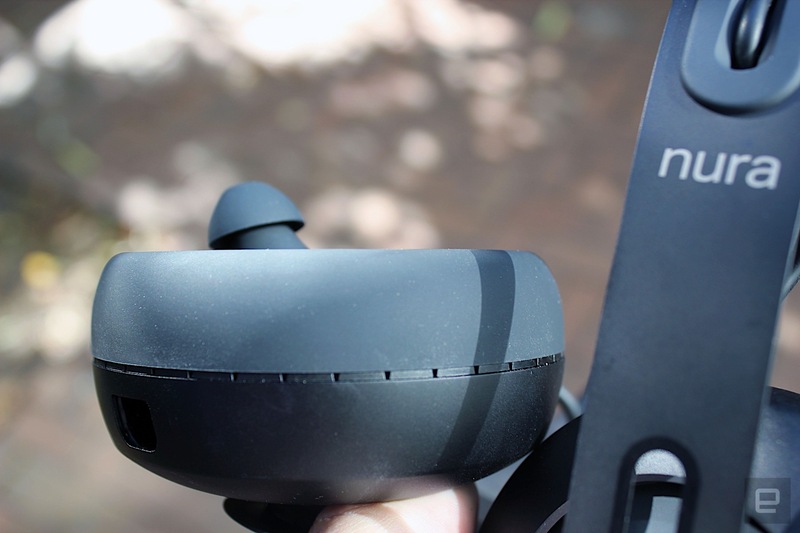 You also don't need the app once you've gone through the setup -- the settings are stored on the headset, so you can forget about it completely if you prefer. If you're wondering, you can have up to three different profiles set in the app. It's also a good way to see how different your hearing is to someone else's. I tried my wife's profile, and it actually sounded pretty similar. Both mine and hers sounded pleasing, but mine did sound better (to me). I noticed higher frequencies were a little harsher in my partner's setting, and mids a little subdued. On a more practical note, in wireless mode the Nuraphones last about 20 hours, which is decent. You can also use them with your PC without the 3.5mm cable. When you plug them in via USB, your computer should detect them as an audio output device, so you can easily charge them while listening at work. It's worth noting here that there's no LED, so without the app, it can be hard to know if they are fully charged. For a debut product, the Nuraphones are impressive. The audio voodoo really does add a depth and a sense of clarity to music that almost makes you worry that you must otherwise be slogging through the world hearing the world only half as brightly as you could. The tactile bass adds another dimension (and means you need less volume), though your personal preference may vary with this one, and the slick design touches make this feel like a polished product. But they also introduce a few minor compromises or design quirks that might take some getting used to. If you can live with relinquishing control over connectivity and power to the headphones, you've got little to worry about. At $399/£349, the Nuraphones aren't the cheapest on the market, but they deliver an experience (and musical excitement) that's unique.